activist in the House of Representatives today. moratorium on the Refugee Settlement program. 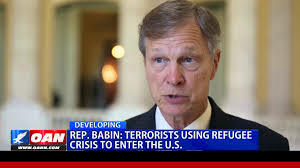 Former dentist from Texas starts to extract the Refugee program by introducing a moratorium to be inserted into the Continuing Resolution to fund the government through Dec. 9th. accounting of the costs of this program. gun toting groups yelling, “Black Lives Matter” and “Justice for Darren Seals”. The big question is what does this accomplish? “intentionally” detonated, with a second device found close-by in Chelsea. connected to a cell phone with wires attached. One of three terror attacks that occurred Saturday. Islamic holidays that occurs during the time of the annual hajj pilgrimage. has decided to close its schools on September 12 to observe a Muslim Holiday.